I don’t know about you guys but my mom had 4-5 recipes that I’d freak out over. I asked for them on repeat every single week. Never mind the fact that the rest of the family wanted something else – I had my favorites and they were frequently requested. One of those was Crispy Cheesy Chicken Schnitzel! 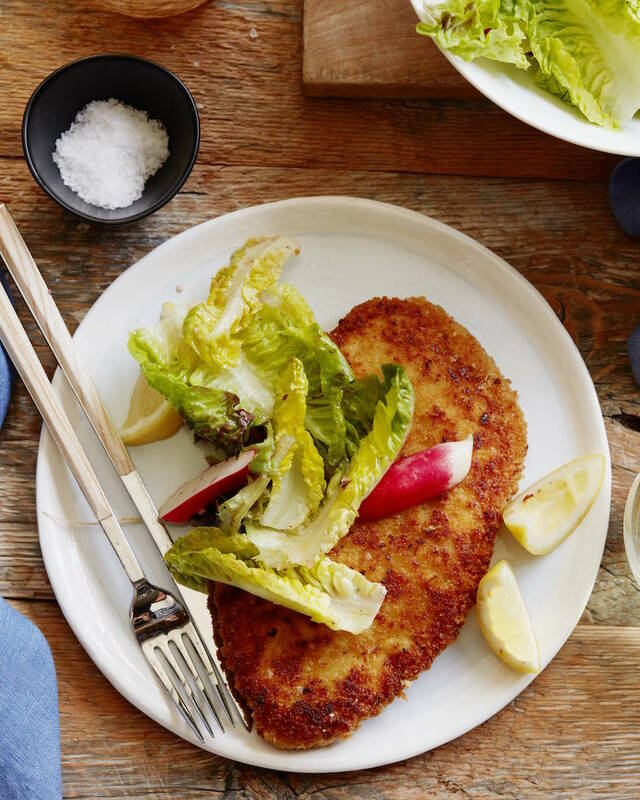 Crispy Chicken Schnitzel is like a fancy chicken nugget. Literally. Pounded chicken cutlets that are dreaded with breadcrumbs and Parrano cheese and then pan fried. 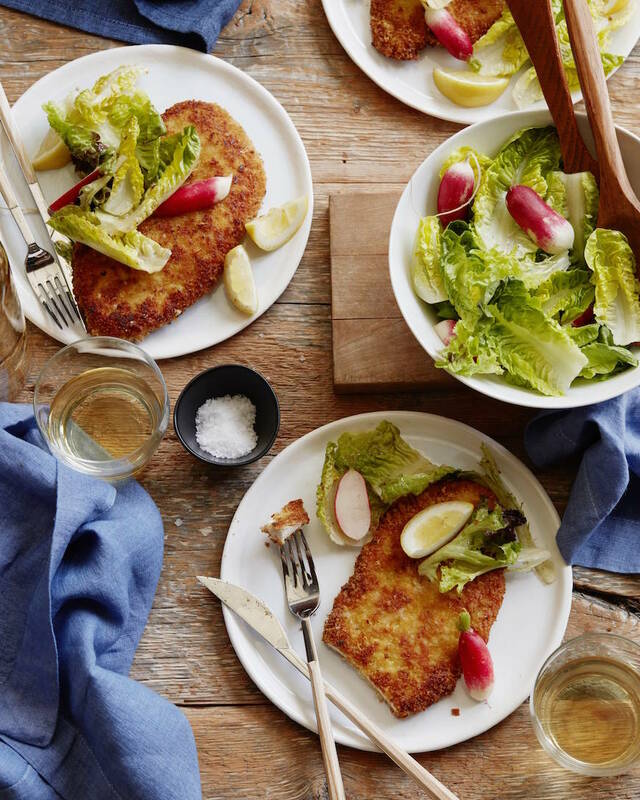 The breadcrumbs give it a bit of a crunch, the Parrano gives it a little nutty and salty kick and then you serve it up with a market lettuce salad on top that is dressed with a lemon vinaigrette to brighten everything up and bring out the flavor. Back in the day I’d just want the Crispy Chicken Schnitzel with about a pound of ketchup on the side, but I’ve classed things up a bit since then and added a salty kick from the cheese. 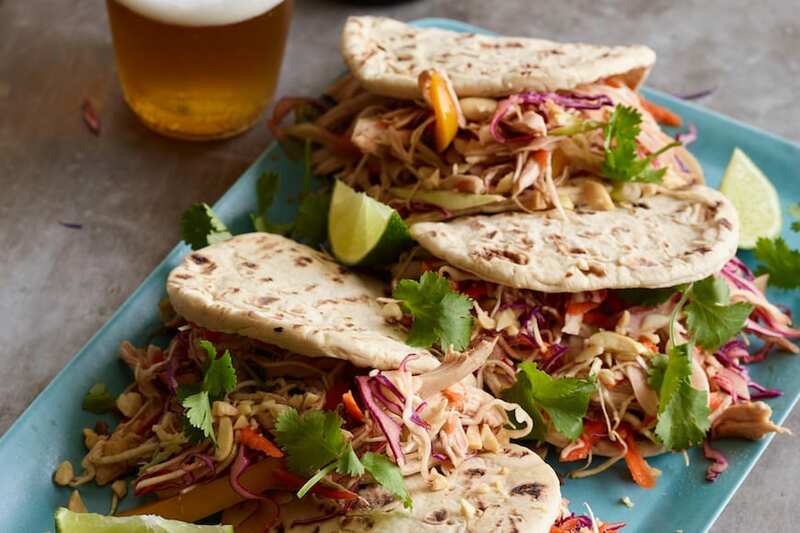 I used to make this constantly as a private chef – and it’s great because I was able to get the kids involved. One would pound out the chicken, one would do the breading station and then one would make the salad. Everyone got put to work and then I fried everything off and dinner was done! ALSO… If you haven’t tried Parrano on my Roman Zucchini Pizza yet – GET TO IT!! It’s Zucchini season and there is pizza to be consumed! Whisk red wine vinegar, shallot, Parrano cheese, garlic, salt, and black pepper together in a small bowl. Slowly stream olive oil into the vinegar mixture while whisking briskly. Whisk lemon juice into the mixture. Pour dressing into a sealable jar or bottle, seal, and shake until emulsified. 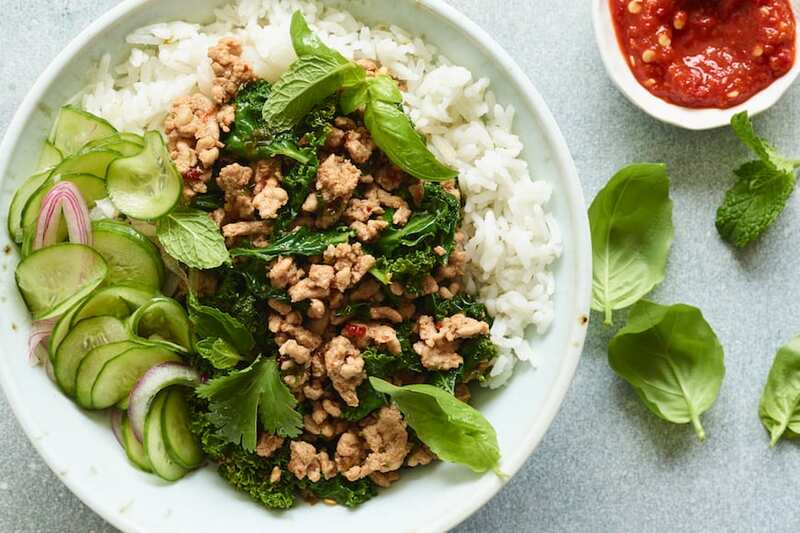 Place the chicken breasts in a plastic bag, one at a time, and pound them so they are about 1/2 inch thick throughout its entirety. Prepare 3 bowls, one with flour, salt, pepper, lemon zest and the garlic powder, one with whisked eggs and the last with Panko bread crumbs and Parrano cheese. Place each piece of chicken in the flour, coating both sides, and shaking off any excess. Next dunk it into the whisked egg – let any excess liquid drain off. Next, coat it with the panko / parrano mixture. Place a large skillet over medium high heat and add the olive oil. Once the oil is hot, carefully place one piece of Chicken Schnitzel into the pan and let it cook for 3-4 minutes and then flip it over to finish cooking. Each piece should be golden brown on both sides. Remove the chicken to a paper towel lined plate and repeat the process with the remaining chicken. Once all the chicken is cooked, give it all a generous squeeze of lemon and season with salt. 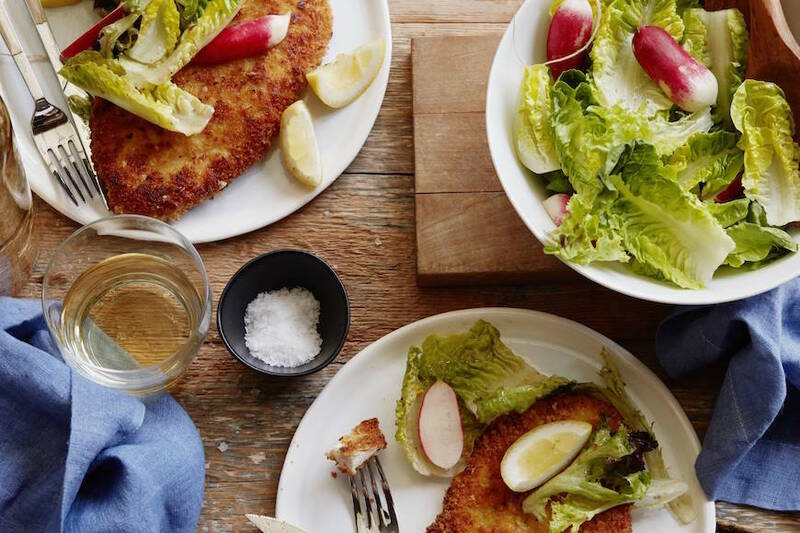 Dress the market lettuce with the vinaigrette and serve on top or alongside the schnitzel. OMG!! love the schnitzel!! 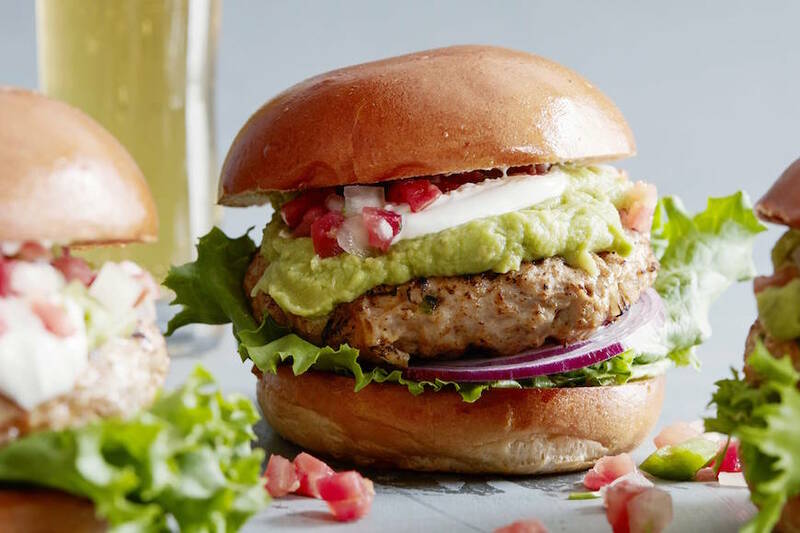 this looks absolutely amazing with that fresh green salad! One of my favs! Yours looks perfect!! I wish my mom had made this for me when I was a kid. SUPER kid and adult friendly!! Great for a party too! oh my gosh! this looks so good! I love all of this! So cool that you made it a group effort in the old days! 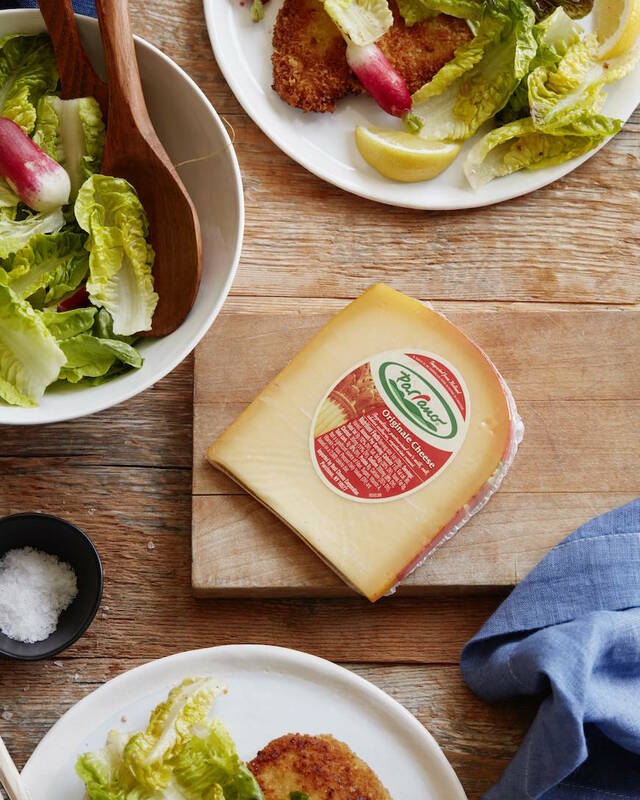 What kind of cheese is this or is it similar to?